Five gun security cabinet. Illustration courtesy of Cabela's. Homak Manufacturing (www.homaksecurity.com) builds welded sheet steel gun security cabinets for handguns and long guns. The latter are designed to hold from five to fourteen long guns, depending on the size and configuration of the safe. Most Homak security cabinets are rectangular and intended for mounting against a wall or in a closet. In addition, there is a 10-gun model with five shelves at the rear that is designed specifically for corner mounting. These are economy security cabinets, not really "gun safes" in the Browning or Fort Knox sense of the word. On the other hand, they offer far better security than a wall rack or glass-front display case. These are lightweight security cabinets, so they should be bolted to the floor and/or wall to make it more difficult for thieves to carry off the whole safe. The 5-gun model shown above, for example, only weighs about 60 pounds. I have owned and used a Homak 8-gun security cabinet for many years with no problems. It measures 55" tall by 21" wide by 10" deep and is fabricated from steel measuring approximately 0.06" thick, according to my digital caliper. The interior of this rather small gun cabinet is largely devoted to storing long guns, with a single sheet steel shelf suitable for a couple of small handguns, binoculars, or a modest quantity of ammo above. The shelf and the interior of the safe are not padded, so use care to avoid scratches and dings when removing or replacing guns. There are two plastic trays, each about the size of a box of 12 gauge shotgun shells, attached to the door of my 8-gun safe and most of the other Homak models. The notches in the gun rack glued to the back of this safe are very close together, so much so that there isn't adequate space for the bolt handle that sticks out from the side of ordinary bolt action hunting rifles. The exception would be the slot at the far left end, as there is sufficient space for a bolt handle between that notch and the wall of the safe. Nor is the depth of the safe adequate for rifles with large scopes. I find the Homak gun cabinet best used for storing break-open single barrel or O/U shotguns and rifles, lever action rifles and falling block rifles. Security is provided by two keyed barrel locks ("premium security locks" according to Homak) on the left side of the door, which operate a total of four locking bolts (two each). There are two locking bolts securing the front of the door plus one bolt at the top and one at the bottom. The locks are not protected against drilling or punching. There is a rather light duty, but full-length welded and pinned, hinge along the right edge of the door. Homak recommends installing this safe inside of a closet to make it more difficult for a potential bad guy to pry it open with a crowbar, which is a sound idea. These Homak gun cabinets seem particularly vulnerable to that kind of attack and closet mounting would deny an intruder the space required to get the necessary leverage. Homak gun cabinet retail prices start at about $100 in 2007. ($97.99 at Cabela's for the 5-gun model illustrated at the top of this article.) I consider these Homak gun cabinets suitable for a starter gun collection or to handle the overflow from your main safe. They also meet most state minimum storage standards, where applicable. 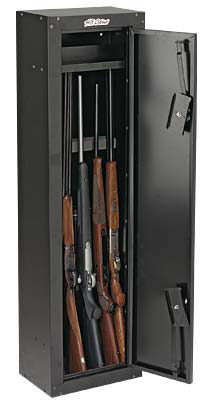 A Homak gun security cabinet does not offer the security of a heavy duty gun safe, nor does it cost nearly as much. They don't take up a lot of space and they are certainly better than storing your firearms, unprotected, in the corner of your closet.